Many people, who are digging the improvisational soils and their exotic seeds, could be conversant with Turkish born clarinet virtuoso Oguz Buyukberber for his nice tapping style and his musical syncretism, which aggregates elements from American jazz, European classical music and Turkish traditional one, but they supposedly ignore the talented Italian avant-garde sound artist Emanuele De Raymondi, who recently recorded his debut release in an inspirational loft in Kreuzberg, Berlin, in spite of his remarkable collaborations and performing experiences and just chose Buyukberber's improvisations to give proof of his acquaintance with electronic compositional techniques. Clarinet, "extended" techniques and electronics have never been in cahoots like in the most recent years - think about known and unknown musicians such as Milos Sugar, Karlheinz Essl, Georg Antoniv, Harold Rubin and many others -, but the sublimation of this nice member of winds family, which manages to produce "rissoles" of amalgamated high frequencies and bizarre harmonics, by De Raymondi sounds focused not only on different treatments of its sound - I particularly enjoyed the ones when Emanuele seems to stretch clarinet's voice and Oguz's breathe like in the second (superb!) and seventh variations as well as those ones when he "pricks" frequencies or manages to make them hiccup as he emulates a sort of cutting edge -, but also on a careful and extremely clear study on spatial placement of sound, which could be helped by the location he chose for the recording. The dedication of this debut release to Giorgio Mortari, the head behind the highly regarded and notorious festival Dissonanze, which he successfully organized in Rome by inviting very important names of different stylistical fields of electronic music, is really moving. Former member of the primordial Einsturzede Neubaten line up, founder of the seminal female band Malaria!, milestone of German post-punk scene, label manager of the appreciated Monika Enterprises, whose musicians have often been a finishing line whenever reviewers used to speak about the so-called forlktronica, club promoter, voice and selector of the weekly radio show Oceanclub together with Thomas Fehlmann, Gudrun Gut has been justifiably considered one of the so pioneering key figure of Berlin scene that she could be likened to an historical monument of that huge creative smithy. That's why the fact she decided to move out of Berlin - she entirely recorded "Wildlife" in Uckermark, a countryside town, sited not so far from German capital city - in order to get inspired for her new album and her temporary transplanting and seclusion in a rural environment could sound a little bit strange for a character who sounded so accustomed to an urban aesthetics. Although such a "coming back to nature" could be considered a return to the source - she grew up on the Lunenburg Heath - or ascribed to the general rediscovery of a natural dimension as a follow-on from the crisis of individualism, the marrow of her sound still linger on electronic structures, which oscillates between primeval new wave and industrial dance aesthetics and contemporary dub-techno, but her sonic language looks like pierced by "orgonic" and organic energies: therefore whenever her synths secretes sticky sounds (like in the dub-driven "How Can I Move" or in the darker "Tiger"), it seems she just echoes the secretion of resin as well as some percussive elements sounds like coming from tree hollows. While listening the album, you could almost feel that natural environment gradually hugging Gudrun's sensitivity, which looks like going native in many moments of the album, such as in the blissful feeling of con/fusion and annihilation of "Little Nothing", in the daydreaming abandon of the lovely "Slow Snow", in the progressive detachment from social roles and scripts (as it seems to be suggested by "Erinnerung"), in the contemplative mood of the enraptured "Leaves Are Falling", in the immersive experiencing of freedom of "Frei Sein" as well as when she looks like singing about a moment when she develops an awareness of physical human finitude by means of an eloquent and allusive revision of Bonnie Tyler's "The Best" - the most known cover is undoubtedly the one sung by Tina Turner -, whose almost recitative interpretation could remind Romy Haag or Amanda Lear singing styles. One of the most recent release caught in the meshes of the 12k limited series includes a dedication by talented sound artist Stephan Matieu to Wilhelm Kempff, one of the greatest pianist, organist and musical "popularizer" (his quiet "transcriptions" on vinyl of classics by Ludwig van Beethoven, Franz Liszt, J.S.Bach, Robert Schumann and many other classic composers took him up for more than 60 years) of last century, whose Beethoven's Piano Sonata No.26 known as "Le Adieux" from a double 78 rpm vinyl edition, which has been played through two mechanical-acoustic gramophones - a vintage element which goes steady with computer in Matieu's constant sonic equipment -, was used as an input for an autogenerative process. Even if both sources and equipment could look like aged, the sound of "Coda (for WK)", which could be considered a conclusive sequel of "A Static Place" - this 20-minutes long lasting track was previously issued on the ultra-limited vinyl edition of the mentioned album by Minority Records -, his previous release on Taylor Deupree's label, doesn't show any clues of ageing: it sounds like an halftone drone, focusing on the so-called "Schwebung effect" (a German word Stephan used to name his label in order to describes the process consisting of "the beats produced by the simultaneous vibration of two sounds, especially in unisons and octaves when nearly, but not quite in tune.") and the catching intersections and beating sonic effect of hypnotic extended tones and flickering over-stretched frequencies flowing nearby the same tone, which sound crepuscolar, dazzling, plushy and auroral at the same time. Pure bliss for audiophiles! Title: Allelujah! Don't Bend! Ascend! This is the word the cryptic 9-piece of Canadian anarchists Godspeed You! 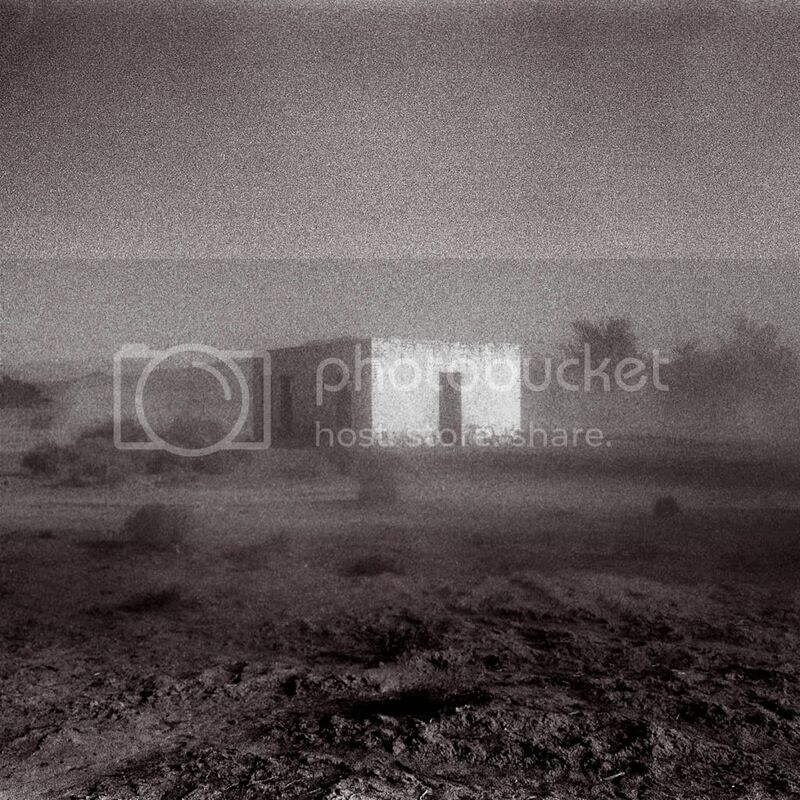 Black Emperor used to project on a backdrop during their live performance, as a funereal string quartet mirrormelded with a terrifyingly good rock band to create something new, something powerful and beautiful. They were dancing in the ashes from the start, paranoid murmurings over crumbling court music, but it was always about the final kiss at the ramparts. About trying to maintain optimism, in the face of debt and depression. They created a genre, hordes of imitators, and classicism was becoming good again, and live shows were becoming ritualistic crescendoes. And then the twin towers fell. And a shadow fell, and thousands held their breath, hoping the angels of death would pass us by in the night, hoping the black-hooded gestapoes would shy away from our doors for another night. The shiny utopias of '90s rave futurism faded into memory, and we just didn't know WHAT the future would bring. Godspeed You! 's lights went dark, and sometimes it seemed like all hope might be lost. But GY!BE were not dormant during their 10-year hiatus. Many members delved into revolutionary cabaret mysticism with A Silver Mt. Zion and a million different permutations, where they showed a more human side, even featuring conventional songs and lyrics. Their records were always tasty and interesting, but nothing could touch on Godspeed You's elemental alchemy. Constellation records, their perennial home, continued to manifest quality works of adventurous art, consistently producing lavish sleeves and vinyl, becoming synonymous with Vinyl Fetish fame. And finally, Godspeed You! Black Emperor put out a new record. ''Allelujah! Don't Bend! Ascend!' came out today, to baited breaths. Constellation have had to halt vinyl orders for a while, and we are all wondering: 'will it be as good as we hope?' Post-rock has become a sad joke in the last decade, pale Mogwai and Explosions in the Sky weak-kneed hippy noodling, an excuse to write long-winded opuses and try to impress chicks with yr long bandname. As with The Swans' record that came out earlier this year, the elder statesmen yet again school the imitators. 'A!DB!A!' is comprised of 4 parts, two long-players and two shorter, in traditional Godspeed You! form. The opening 'Mladic' comes on slow, with a Hebrew flavor that leaves a whiff of incense on the air. It was inspired by Rebitika, Greek protest music from the '20s and '30s, and finalizes with pots and pans clanging, recorded at a street protest. Godspeed you are still in the trenches. But there are differences... you begin to notice less of a classical air around the 9 instruments, and more of a tattered and trailing sound, like a ghost ship, washing in from sea. Middle eastern scales dance around a propulsive krautrock beat, before culminating in a Guy Fawkes' Day melee. Its more of an endless, jamming groove than this outfit has laid to tape previously, and its rendered in typical Hotel2Tango hi-fi has all the instruments breathing and hanging together lovingly, and is a large part of the reason why Godspeed You! smoke their lesser brethren, every time. Its this classiness, attention to detail, and a clear artistic vision, that have allowed GY!BE and co. to rise above, to weather the storm, all these years. After years of gloomy soothsaying, re: the fate of the independent label, Constellation is still laying out exquisite gems of bending notes and honest sentiment. Godspeed You! have returned, and 'Allelujah! Don't Bend! Ascend!' is a triumph. They are trying new things, while maintaining true to form. The two long-players, 'Mladic' and 'We Drift Like Worried Fire' are on par with 'Moya' from the 'Slow Riot For New Zero Kanada' EP for sheer awesome revelations, and should be experienced, if you missed this band the first time around. The two shorter middle tracks, 'Their Helicopters Sing,' and 'Strung Like Lights at Thee Printemps Erable' are interesting sound experiments, full of whirring, whoofing drones to meld with yr radiators and refrigerators, during the coming cold months. The shorter tracks were released on a seperate 7' in the vinyl edition, with the two long tracks on a 12' to give someone the option for going for dreamy ambiance or joyful clockwork trance bombast, if that's yr bag. Godspeed You! Black Emperor have shown that there is still hope, after all, and maybe Post-Rock is not dead, and mined out for ideas. Classical music has always been cool, and cynicism always gets tired. Let's build quiet armies, friends, let's march on glass cathedrals. The future is ours.